Rabbi and author; born July 17, 1858, at Lodz (Russian Poland). He studied at the yeshibot of Lublin and Wilna and then (1881) went to Berlin, where he still resides. He officiated as preacher at Fürstenwalde from April, 1883, to 1886, and in the Congregation Ohel Yiẓḥaḳ at Berlin from April, 1886, to 1887. Since 1887 he has devoted himself exclusively to writing. He was one of the founders of the Verein für Jüdische Geschichte und Literatur of Berlin, and of the Verband der Literatur-Vereine at Hanover (1894), whose secretary he still is. 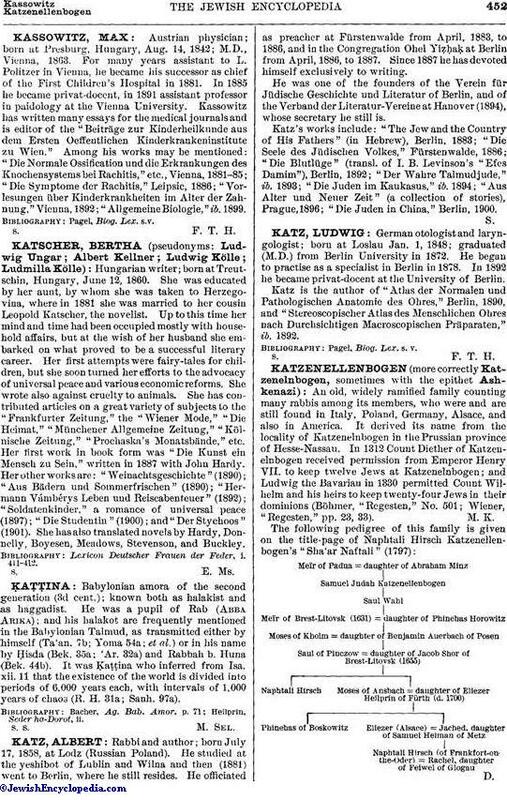 Katz's works include: "The Jew and the Country of His Fathers" (in Hebrew), Berlin, 1883; "Die Seele des Jüdischen Volkes," Fürsten walde, 1886; "Die Blutlüge" (transl. of I. B. Levinson's "Efes Damim"), Berlin, 1892; "Der Wahre Talmudjude," ib. 1893; "Die Juden im Kaukasus," ib. 1894; "Aus Alter und Neuer Zeit" (a collection of stories), Prague, 1896; "Die Juden in China," Berlin, 1900.